The Osun State governorship election holds today August 9, with 20 candidates representing 20 political parties vying for the ticket to the Osun Government House. Apparently, the contest is between Rauf Aregbesola, the incumbent governor and candidate of the All Progressives Candidate (APC) and Iyiola Omisore, a former Senator and candidate of the Peoples’ Democratic Party (PDP). Fatai Akinbade, a former Secretary to the State Government and candidate of the Labour Party (LP), is, however, hoping to spring a surprise on both major contenders. 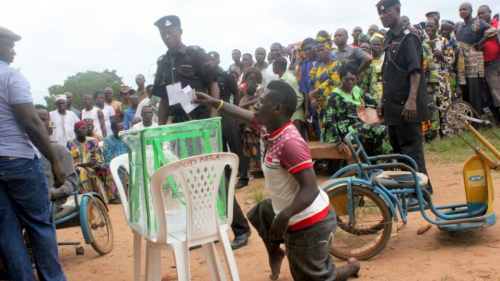 A total of 1,407,222 registered voters (INEC’s post March 2014 CVR) spread across three Senatorial Districts – each of the Districts have 10 local governments – are expected to cast their votes. The gender distribution of the voters shows that there are 661,394 (47%) male and 745,828 (53%) female voters across 332 Wards, 3,010 Polling Units, and 3,379 Voting Points in the state. Osogbo, the state capital, has the highest number of registered voters with a 110,670, followed closely by Ife Central with a voting population of 95,471. While Mr. Aregbesola enjoys a huge support in the capital, Mr. Omisore hails from Ile-Ife. 19 domestic and 10 foreign observers were accredited by INEC to monitor the election.